Experience is key when considering the right team for your industrial scale installation. Our team of professional scale installation technicians has installed literally thousands of scales over a nearly 30 year span. There isn’t much we haven’t come across, and that experience has allowed us to help our clients save big. There are many factors to take into consideration when planning a major install, and only a team with vast experience should be considered to take on the task. Evaluate the physical aspects of your site and the types of truck scales available. Platforms can be mounted above ground, with ramps for accessing the driving surface, or pit mounted so that the driving surface is level with the surrounding grade. 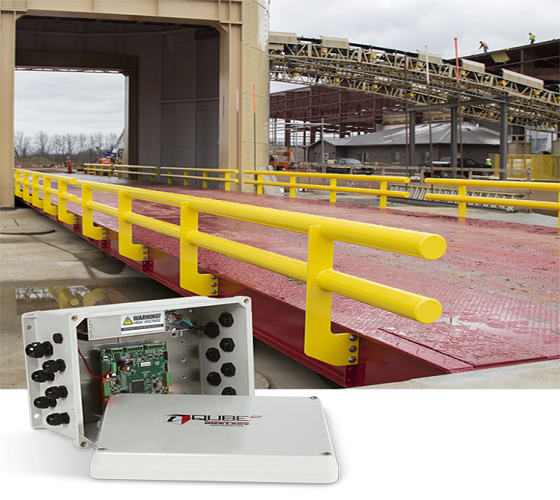 Above ground systems can take up a significant amount of space on site because of the ramps. Conversely, pit mounted truck scales will take up less surface area, but the civil and foundation work required can make them a more expensive option. Your chosen supplier will be able to advise on the best type of truck scale for your particular site and usage requirements. It is important to fully understand the location of all underground and overhead services. Underground services such as water, sewer, gas and electric can affect where you locate your scale. For example, a pit-mounted scale requires substantial excavation and foundation construction. The presence of underground services can add substantially to those costs. One of the first things to consider for a pit-mounted system is the height of the water table and the level of the local surface water drainage system. With a full site survey, it is possible to identify and overcome such issues, either by ensuring that such services run well beneath the weighbridge foundation, or by locating the foundation so it does not interfere. Another critical consideration is the soil bearing capacity at the chosen site and understanding the options if the soil bearing needs to be increased in order to have a stable foundation. Whether pit of surface mounted, the use of a crane during the installation process can be complicated by the presence of overhead power lines. Consult with your supplier to ensure the platforms can be transferred from the delivery trailer to the foundation in a safe and cost-effective manner. Early in the process, it is critical to review the project with your local authorities to make sure all requirements are understood and met in regards to construction codes, electrical codes, zoning permits, etc. Always consider the turning radius of the longest vehicles that may access the system. Ideally, vehicles are able to enter and exit the scale platform in a straight line. There also needs to be adequate clearance for items that protrude from the vehicle such as side-view mirrors, bumpers, stepping boards, fuel tanks, etc. Simply driving one of the longest known vehicle through cones where the truck scale and ramps will be is a simple yet effective exercise. Again, consulting with North Texas Scales is time well spent. Make sure you are selecting a platform length and width that will accommodate all known vehicles that will access the truck scale, with wheelbase dimensions being a critical consideration. Anticipate future needs as well as current needs. It can be fairly simple to extend the length of the scale at a later date, but it is much more difficult to add width without replacing the entire system. Health and safety issues are always important, so one of the first things ensure is that you do not position the truck scale where there are likely to be any pedestrians. Systems are often positioned near the entrances and exits of a site, so you need to think about how to avoid congestion and having vehicles backed up onto streets or highways. Some of this planning will involve more than simply thinking about where to position the scale platform If drivers are required to exit their vehicles as part of the weighing transaction, you want to make sure they have a quick, safe means for getting off and back onto the platform. If a wheel washer will be used ahead of the scale, it should be far enough back so the driving surface is not constantly wet. Consider the benefits offered by a driver operated kiosk system. There are many system options such as entry and exit barriers, signage, traffic lights, etc. These systems allow drivers to complete weighing transactions 24/7, without leaving their vehicle. Unattended systems can enable more efficient processing of vehicles and allow the system to function without a dedicated operator, lowering operating costs and extending the hours of availability. When making a truck scale selection, you must consider any heavy, off-road vehicles on that may be on site and access the platform such as large forklifts, cranes, front loaders, etc. These vehicles may have concentrated axle loads and gross capacities that exceed the system’s ratings and may cause damage. After investing significant time and capital in selecting and installing your truck scale system, it is wise to also invest in a service and maintenance contract that will minimize downtime, maximize up-time, and ensure that it keeps operating at peak performance over its service life. In conclusion, a truck scale is a major investment and is central to the success of your operation. With careful planning and professional advice, you can ensure that the system will operate smoothly over a long period of time. The best advice is to seek professional assistance from North Texas Scales, who will act in a consultative role before, during, and after the selection, installation, and commissioning of the system.